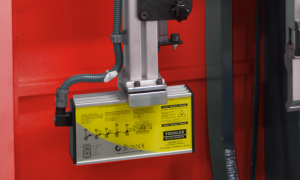 What’s in a small press brake? It’s been said that “the little guys sometimes punch well above their weight class.” Such is the case with JMT USA’s brand new ADR 1260 4 foot press brake. This new addition to the JMT USA press brake lineup has nothing to be humbled about when compared to its larger brethren. Just because this machine has a demure stature don’t let that fool you. 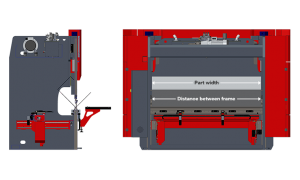 The ADR 1260 is a heavy weight in its own size class, if you were to compare the components of this machine to press brakes of considerably larger capacities, what you would realize is this is a small press brake made out of big press brake parts! As with all JMT USA press brakes, quality is built in from the ground up. Continuing on with JMT’s philosophy of building quality into the machine, the ADR 1260 press brake starts with a stress relieved machine base finished milled on 5 axis machining center. Linear rails for all moving components of the brake as inconsequential as material support arms and back gauge fingers are standard on this feature packed machine. Inverter controlled servo motors for all main moving components like the rams and back gauge are also included on this model. Accuracy has not been sacrificed in favor of price. The ADR 1260 maintains a plus or minus 4 ten thousands (+- .0004) ram positioning accuracy, just like its big brothers. As the ADR 1260 has a bending length of 4 feet 1 inch what you end up with is a power house of capabilities that doesn’t take up much more floor space than a large air compressor! With 66 tons of bending force, you can imagine the ability to bend a fairly thick sheet at 4 foot wide with the capabilities to bend even thicker sheet at less than full working width. 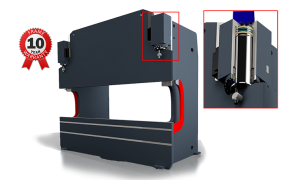 This machine comes standard with a CNC Controlled X Axis Back Gauge, Euro/American Style Punch Clamp, Rear Work Light, Sliding Front Sheet Supports (2) with a Linear Rail, and a Dual Palm/Foot Station w/ Selector Switch. Think all the good stuff stops there? It doesn’t. In addition to what we have listed above, add the brand new DT-10 C N C controller. 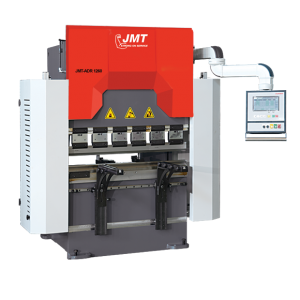 Through many phases of development and improvement JMT USA is now proud to be able to provide the DT-10 controller to this small but formidable press brake. This will make the ADR 1260 the undisputed world champion of profit to cost ratio of any press brake in this size range. The DT-10 controller was designed to be very easy to use, completely intuitive, comes with a 10.1 inch LCD touch screen display, can download to or be backed up from a USB source. The DT-10 also incorporates 2 “D” graphics with step by step picture instructions so the operator will know when to flip or turn the work piece. This new controller will also recommend a bend sequence to the operator once the piece part dimensions have been loaded into the memory. The DT-10 is also capable of storing punch and die information into the memory right alongside the piece part input. As you check out the specifications below notice the extensive control of every machine movement on the ADR 1260 which is now programmable, courtesy of the new DT-10 C N C controller. Safety has not been ignored on JMT USA’s ADR 1260, a simple laser finger guard aligned to the punch tip will help prevent operator safety issues that may otherwise occur.